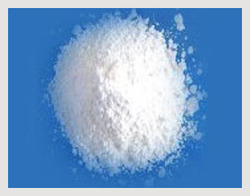 TheAntimony Pentoxide Powderis the spray-dried powder that is used as synergist with halogenated flame retardant in polymer, solvent and adhesives. This dispersible dry power allows greater retention of the original physical properties in most systems. ASSAY 80% Min. 84% Min. Ni 50 ppm Max. 50 ppm Max. Cu 50 ppm Max. 50 ppm Max. The Antimony Pentoxide Powder is the spray-dried powder that is used as synergist with halogenated flame retardant in polymer, solvent and adhesives. This dispersible dry power allows greater retention of the original physical properties in most systems. Specifically manufactured for flame retarding chloride. Used for phosphite type stabilizers to enhance heat stability. Used for flame redundancy, preferred for reproducible colour matching. Free flowing particles for easy processing, better mixing and exceptional consistency. Mass tone color and light transmission using non-pigmenting. Disperses to Nano sized particles. Low metallic impurities like arsenic and lead etc. Specifically manufactured as flame retarding chloride. Uses as flame retardant in P.V.C, ABS, HIPS, Poly Propylene, Epoxic. ASSAY (Sb2O5) 80% Min. 84% Min. Sb2O3 0.2% Max. 0.2% Max. As 0.05% Max. 0.05% Max. Pb 0.1% Max. 0.1% Max. Fe 100 ppm Max. 100 ppm Max. Ni 50 ppm Max. 50 ppm Max. Cu 50 ppm Max. 50 ppm Max. 100µm Sieve refulal 0% Max. 0% Max. 50µm Sieve refulal 10% Max. 10% Max. pH 5 - 7 Min. 5 - 7 Min. Water Content 0.5 Max. 0.5 Max. Looking for Antimony Pentoxide Powder ?